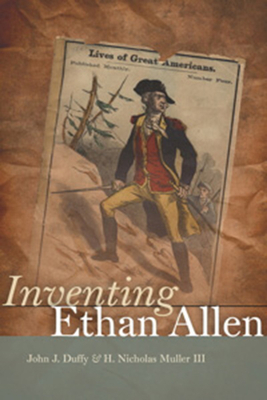 Since 1969, Ethan Allen has been the subject of three biographical studies, all of which indulge in sustaining and revitalizing the image of Allen as a physically imposing Vermont yeoman, a defender of the rights of Americans, an eloquent military hero, and a master of many guises, from rough frontiersman to gentleman philosopher. Seeking the authentic Ethan Allen, the authors of this volume ask: How did that Ethan Allen secure his place in popular culture? As they observe, this spectacular persona leaves little room for a more accurate assessment of Allen as a self-interested land speculator, rebellious mob leader, inexperienced militia officer, and truth-challenged man who would steer Vermont into the British Empire. Drawing extensively from the correspondence in Ethan Allen and his Kin and a wide range of historical, political, and cultural sources, Duffy and Muller analyze the factors that led to Ethan Allen’s two-hundred-year-old status as the most famous figure in Vermont’s past. Placing facts against myths, the authors reveal how Allen acquired and retained his iconic image, how the much-repeated legends composed after his death coincide with his life, why recollections of him are synonymous with the story of Vermont, and why some Vermonters still assign to Allen their own cherished and idealized values. JOHN J. DUFFY is emeritus professor of English and Humanities, Vermont State Colleges. H. NICHOLAS MULLER III has served as president of Colby-Sawyer College and dean and professor of history at the University of Vermont. Both have published widely on Vermont topics, including a co-authored monograph, An Anxious Democracy:Aspects of the 1830s.